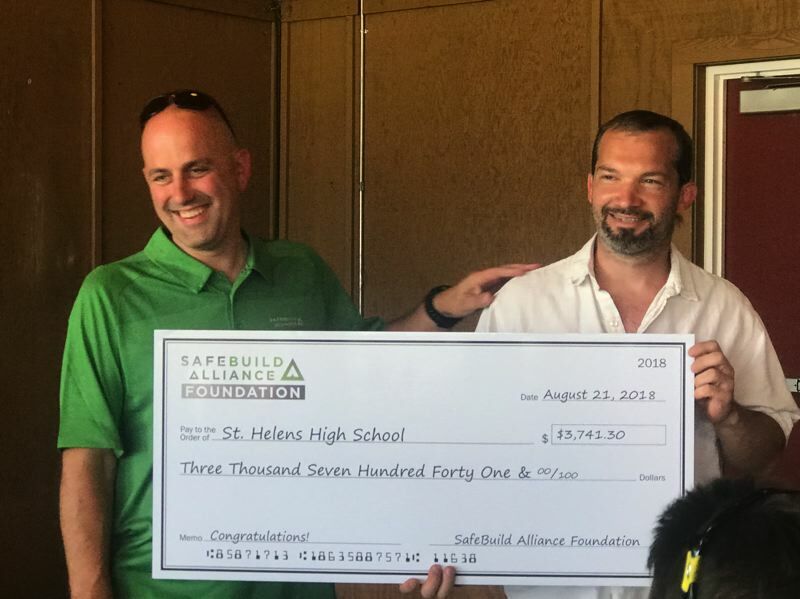 The St. Helens High School renovation and remodeling program was one of only two groups to be recently awarded grant money from the SafeBuild Alliance Foundation. The high school's renovation and remodeling program, often referred to as R&R, received just over $3,700 through the inaugural grant program being organized by the SafeBuild Alliance Foundation. The SafeBuild Alliance Foundation is nonprofit group that works to promote safety on worksites and in the construction field to prevent injuries. This was the first year the group offered the grant program. St. Helens construction teacher Joe Mauck, who instructs the R&R class, was recognized during an awards ceremony Tuesday, Aug. 21, at a fundraiser golf tournament for the SafeBuild foundation in Wilsonville. The high school R&R program allows students to enroll in a high school course where students help repair and rebuild homes in the St. Helens area. Rather than learning to build houses from the ground up, students learn skills in home repair and remodeling. It also teaches students about the home buying process, the housing market and return on investment. In 2017, students completed their first remodeled home, which was then put on the market and sold soon afterward. The proceeds from the sale allowed district administrators to invest in the next property. Mauck said the grant money allows him to purchase safety equipment and provide training for his students who will need to do intensive roof work on the home during the 2018-19 school year. "It's quite a cool grant because otherwise we couldn't redo the roof of our R&R house," Mauck said. The grant funding will allow the school to purchase harnesses, horizontal lifelines, cable sleeves, and all equipment necessary for roofing houses, the grant application states.